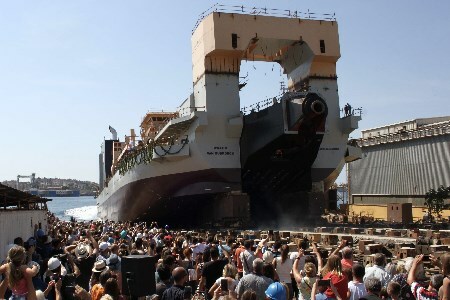 At the Uljanik Shipyard in Croatia, Mrs. Julie De Nul released the self-propelled cutter suction dredger Willem van Rubroeck in the sea by cutting the traditional ties of the rope. The delivery of the vessel will take place in 2018. The vessel has a length of 151.3 m, a width of 36 m and can develop a speed of 12 knots. It has an installed power of 40 975 kW, making it the world’s most powerful cutter dredger. It disposes of two retractable thrusters with a total power of 6000 kW and three dredging pumps with a total power of 25 500 kW, of which two located in the pump room and one in the cutter ladder. This vessel will have a cutter power of 8500 kW and will be able to dredge compact sand, clay and rocks up to 45 m deep. The operation, controlled from a central station, is almost completely automated. The vessel will have a high standard accommodation for 67 crew members.